In today’s urban environments, wildlife often cross paths within our living and working spaces. Commercial property sites are not immune to this exposure with both birds and other urban wildlife species. 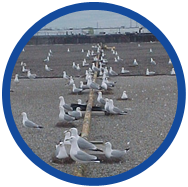 Commercial properties often provide wildlife with sufficient food, water and shelter necessary for them to survive. The wildlife adapt to these habitats of well manicured turf, storm water retention ponds and safe structures. This is when wildlife conflicts begin, and exposure to them can be more than just a nuisance situation. A new threat on the horizon is the unbalanced populations of the Double Crested Cormorant. This avian species has had a resurgence into urban and natural environments since early 2001. Large populations overtake gull colony habitats, and devastate landscapes with the accumulated droppings and aggressive feeding. 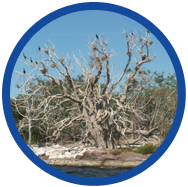 Our wildlife professionals are well versed in the humane methods of Cormorant controlÂ and continue to expand on effective techniques to regain properties taken over by this species. 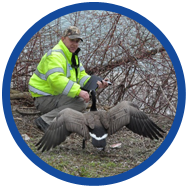 When the need to address the hazards associated with wildlife, trust in the professionals who can effectively resolve the issues, and provide a healthy balance between wildlife and people.